An original mini series for Fluide, an all genders beauty brand aimed at creating a more expansive and expressive definition of beauty. Freckle Goes Fluide stars Freckle, a one-of-a-kind performer and muse, collaborator of Grizzly Bear, an iconic presence on TBS’s Search Party and The Gay and Wondrous Life of Caleb Gallo, and an unforgettable contestant on American Idol. Each “Freckisode” is a bite-sized piece of online entertainment formerly described as a commercial. These mini makeup tutorials are delivered in Freckle’s inimitable witty, deadpan style. Directed by feminist filmmaker, Lily Benson, with music by Berlin-based Max Boss of EASTER, and aided by an all-queer crew, Freckle Goes Fluide queers the classic commercial with hilarity. Director Lily Benson “wanted each Freckisode to capture makeup’s real and genuine power — to transform, glamorize, and enable play. 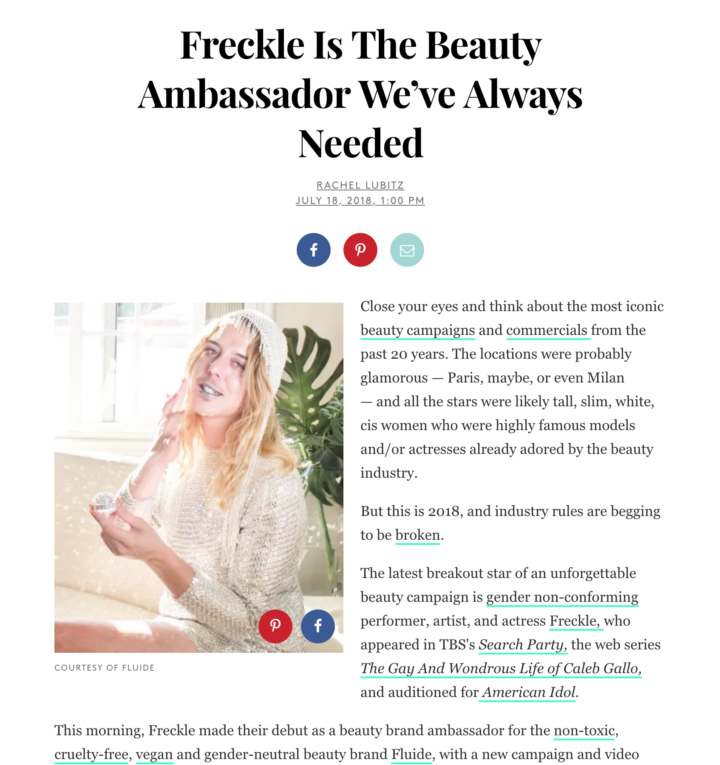 Without using stylists, makeup artists or post-production correction, Fluide’s Freckisode aesthetic is unheard of for a makeup promotion and is totally representative of Fluide’s defiance of normative beauty standards.